Updated and back as a rental! Great location and amenities!!! Come and experience the majesty of Lake Tahoe, surrounded by gorgeous mountains,forests, streams. There is so much to do and see here that it is impossible to do it in a week. We have four South Lake Tahoe Rentals to choose from, and all of our homes have either foosball tables or pool tables and hot tubs, plus great locations. Our homes have some of the best rates in Lake Tahoe, so please take a look at our personal website link. Our homes include the Tahoe Ski Chalet, Skyland Retreat, Black Bear Chalet and the Zephyr Cove Chateau. The Black Bear Chalet is a lodge-style chalet which has three bedrooms, two baths, and sleeps eight people maximum, including children. It has an over-sized great room that features a vaulted ceiling with refreshing ceiling fan (for those hot summer days), and a gorgeous ledgestone electric fireplace insert, and an entertaining Foosball Table. Capture the outside views from the large bay window, or the windows on each side of the fireplace that look out to the conservancy land. There are large windows looking out the third wall also. It has such open views that are especially wonderful when the snow is falling. After a long day on the ski slopes, washing coins in the slots, or shopping the outlets, sitting in front of the fireplace with a glass of wine or a mug of hot chocolate can't be beat! We have just added a 50" flatscreen TV in the living room and a 32" flatscreen TV in the master bedroom. Of course, the Hot Tub just outside the door will help unwind those tense muscles. 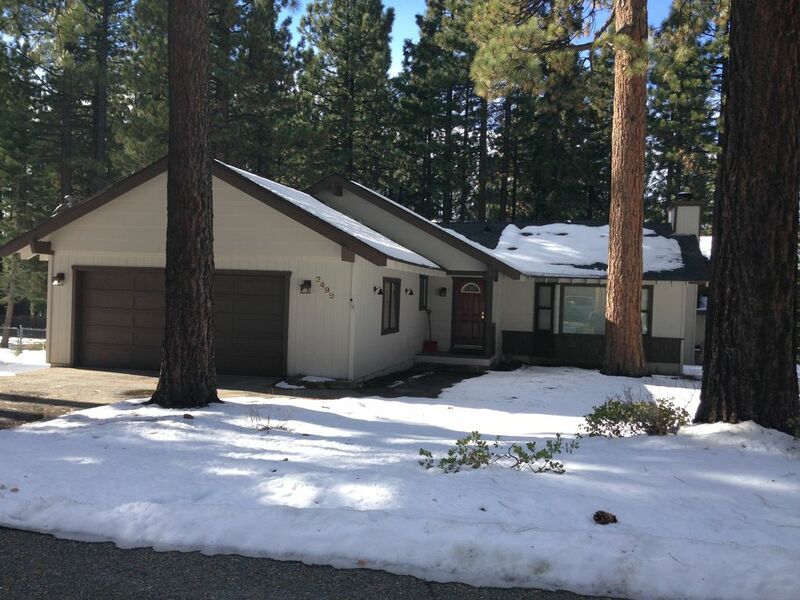 This Non-Smoking home is centrally located within five to seven minutes of world class skiing, casinos, restaurants, and, of course, beautiful Lake Tahoe. Although it is so centrally located and away from traffic, it is less than a block away from national forest preserve which is perfect for hiking and biking in the summer. For the adventurous hiker, there is a fabulous view from the top of the hill of Lake Tahoe, which makes the hike through the National Forest worthwhile. On your way, there is a meandering stream complete with falls, where the kids can enjoy water fun, while the adults enjoy a picnic lunch. It is perfect for those educational nature hikes. After a long day of sporting activities or even shopping the outlets, enjoy the soothing waters of the HOT TUB. The large deck is perfect for relaxing while the steaks are on the barbecue. Enjoy the quiet and hear the sounds of nature. It is truly peaceful!! There are additional chairs that can be pulled up to the table, or seating for two at the bar. 50" flatscreen TV in the living room, 32" flatscreen TV in the master bedroom and queen bedroom. Once inside the house, it is completely on one level. There are 3 steps into the house, so that would be the only problem. Cozy and very close to everything by the casinos. The property was great for are group. Large enough living room all 3 couples had their space hot tub was functional and clean. Hot water in showers. Bathrooms could be updated but all in all great experience. Very nice, great communication with owner, large! Good time, we hit a blizzard so a little stressed. Lost power but no fault of property. All said nice roomy place! Beware of the hill up. No chains and leavi g your car on side of road =tow $610.00. We had a great extended weekend with friends in South Lake. The house fit the 8 of us comfortably and had all the amenities we needed. The hot tub was great since we were there for a race so it was nice to relax after! The kids enjoyed the foosball table. Cheryl was available and answered my phone calls when I had questions/concerns. She was very helpful and informative when it came to the new laws in Tahoe. We appreciated her transparency so that we could prepare and be mindful of the curfews. Overall, we had a great weekend and a great stay! Thank you! I was in town to run a 4 day trail race around Lake Tahoe and we used the house as our home base for my friends who were supporting me. House had everything we needed. Great sized living room for a group to hang out in. I would rent again! Perfect for a comfortable stay. The rooms were nice, everything was clean, very comfortable for our group. Very nice stay and easy to communicate with the owner. The house was the right size and price and easy access to shopping and outdoor venues. We only had a minor appliance issue and discovered some rugs that needed vacuuming, but overall was a positive experience. Just 3.5 miles to the casinos - Harrah's, Harvey's, Horizon, Montbleu, and Lakeside. Also there is the gondola ride up to Heavenly Valley. Great access!